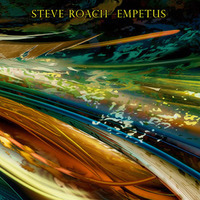 Empetus is full blown sequencer-based music illustrating a further evolution in the visceral side of Roach's music. Nine precise pieces that still sound fresh today. A favorite of sequencer music lovers. Released in 1986, this recording of intricately-woven sequencer lines and buzzing synthesizers established Roach as the American answer to the pioneering European electronic masters of the '70s (Klaus Schulze, Tangerine Dream). Alternately thrilling and serene (sometimes within the space of the same track), EMPETUS' waves of energy rest upon labyrinthine patterns of interlocking notes and wildly cascading tonal clusters. Roach varies the moods from piece to piece as well: the bright, piercing electronics of ''Seeking'' contrast vividly with the starker, sweeping veils of sequenced notes and arcing waves of ''Empowerment'' or the turbo-charged synths that rev through ''Conquest''. It's all riveting, exciting stuff, and although Roach largely abandoned the style as he moved forward, EMPETUS remains an important, if largely unsung, statement documenting the course of modern American electronic music.